Kaitenzushi (revolving sushi) may have the reputation of being quick and cheap, but the quality has vastly improved over the years, and some shops even specialize in hyper-local seafood at good costs. Competition for business from the big chains brings out surprisingly cheap prices. Sushi robots that kick out the rice help to keep costs down. Hama Sushi on weekdays start with a big selection for only ¥90, including seasonal specialties like kanburi (winter yellowtail) and kanbirame (winter flounder). Hama Sushi offers several different soy sauces, including a citrusy ponzu, a smoky dashi soy sauce and an umami-rich kombu soy sauce, making for a fun dining experience. 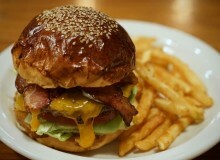 Sushiro, which has recently merged with Genki Sushi, has close to 500 shops in Japan. There are 80 different sushi options for only ¥100. In Tokyo, Sushiro is by-passing Tsukiji Market and receiving seafood directly from fishermen in 70 ports across Japan, which is then flown to Haneda airport. From there it is sent directly to the restaurants. Not only is it fresher, but cheaper too, and these savings are passed on to the consumer. 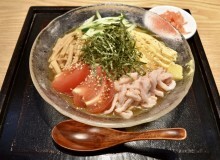 In local areas, Sushiro puts jizakana, local seafood, on the menu. Kura Sushi is offering some interesting options that are Instagram-friendly and kind to those watching their carbohydrate intake. Small cups that look like cut bamboo are stuffed with vinegared rice and topped with tuna or ikura (roe). An original, rice-free option is pickled daikon (in lieu of rice) that is topped with seafood and served on lettuce. There is a shari puchi option, which is sushi but with half the amount of rice. From time to time Kappa Sushi will offer an all-you-can-eat special on weekdays in that quiet time between lunch and dinner priced at ¥1,580 for men and ¥1,480 for women. Be sure to inquire about the offer before going. Two local sushi chains to put on your radar are Tsukiji’s Sushi Zanmai, notably for tuna lovers as the president is a tuna fanatic, and Choshi Maru, named after the famous fishing port in Chiba. All of the big chains are also rounding out the menu with family friendly dishes like karaage (fried chicken), udon, chawanmushi (savory custard) and desserts. When traveling throughout Japan we try and do at least one meal at a local kaitenzushi. We ask the chef behind the counter if there is any local seafood worth trying. I had some of the best kaitenzushi in my life at an unassuming shop at Sakai Minato station in Tottori; seared nodoguro (black throat), seasoned simply with a tart sudachi lime and a sprinkle of salt. Regional kaitenzushi chains are making inroads to Tokyo. The advantage is hyper-regional seafood that is sourced locally and sent directly to the shops. They’re not as cheap as the big chains, but worth going out of your way for. Maimon Sushi from Kanazawa is not cheap. But no sushi robots here. 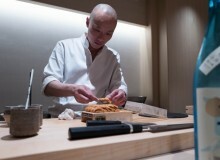 Each sushi is handmade by a chef behind the counter. Kanazawa, on the Sea of Japan, is known for nodoguro, shiro ebi (white shrimp) and akanishigai, a red-fleshed whelk. 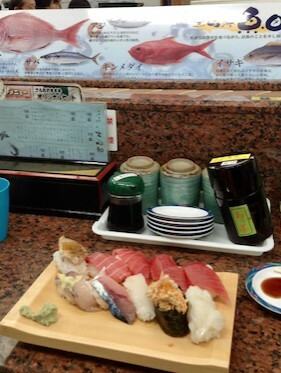 Maimon Sushi has opened its first shop in Ueno. Hokkaido, rich in local seafood, is represented in Tokyo at Nemuro Hanamaru and Hakodate Kantaro. 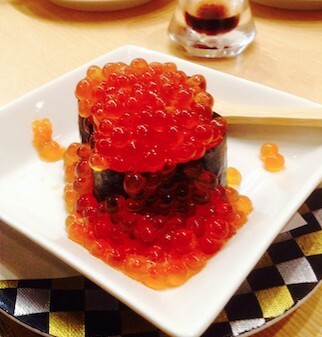 Hokkaido specialties include ikura, uni and salmon. Hanamaru does an aged hirame flounder that is cured in kombu and a sake-friendly cod milt. Numazu is a huge fishing port in Shizuoka. At Sushinosuke, water from Mount Fuji is brought in to cook the rice, a blend of koshihikari and sasanishiki. Local fish include aji (horse mackerel), tachiuo (cutlassfish), katsuo, bonito and iwashi sardines. 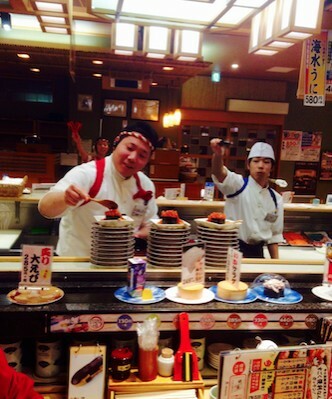 Sushinosuke’s specialty is koborezushi, with three times the regular amount of ikura or uni overflowing the rice. Finally, Nigirichojiro from Kansai includes some Kyoto-style options like a pressed sabazushi, pickled Pacific mackerel and sushi made with vegetables like eggplant with a miso dressing, or senmaizuke (pickled turnip) as an accent to sushi. Kaitenzushi also do take-away or special lunch sets. If you haven’t been recently, give kaitenzushi a try, you may be pleasantly surprised.